Micro-plastic is making its way into our food sources. Plastic is everywhere, and that’s become a problem. There’s growing concern about the prevalence of plastic in the ocean and it’s impact on our planet in ways we might not have foreseen. There is now strong evidence that plastic, particularly micro-plastic, is making its way into our food sources. 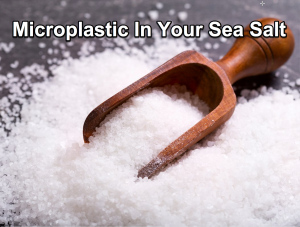 Recently a study conducted at the University of Minnesota showed that Americans could be ingesting a surprising amount of plastic micro-particles from sea salt. Sea salt is made through a process of dehydration, allowing plastic particles in the ocean to remain behind to mimic and mix with the salt. An analysis of 16 brands of sea salt originating from eight countries found all but one contained traces of microplastics. I don’t think anyone feels real comfortable talking about the plastic epidemic we humans have created. If you didn’t already know, I didn’t even want to break it to you that sea salt is now contaminated with tiny bits of micro beads and small particles of plastic from our dependance on plastic bags. Modern living can feel sooo overwhelming. But the truth is the truth, and I felt you would want to know so that you can take steps to keep from ingesting plastic. Although scientists now agree that plastic does indeed exist in sea salt, they have been slow to admit it is a potential health problem without years of study. But who has time to wait? I have had cancer. 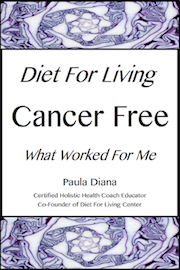 Cancer’s favorite environment is toxic build up in the body. I don’t need a professional to tell me ingesting plastic bits is not a good idea. ‘REAL SALT’: natural sea salt harvested from an ancient seabed buried 300 feet below the Earth’s surface. This inland salt existed during the Jurassic Period, long before plastic and other modern pollutants existed. It’s remnants were buried under protective volcanic ash that kept it entirely unpolluted and unchanged for millions of years. ‘REDMOND REAL SALT’: this salt contains 60 natural trace minerals. It is mined from a prehistoric salt deposit close to the small town of Redmond, Utah. It too is left over from an ancient sea bed from the Jurassic Period, when a large sea covered the majority of what is now considered North America. >TWO: Start becoming very consciousness about how you transport your groceries. According to Earth Policy Institute, nearly one trillion plastic bags are used world wide, every year. The problem is these bags contain polyethylene and cannot completely biodegrade; only breakdown into smaller and smaller particles. Purchase re-usable shopping bags. I also recommend net bags to carry your fruits and veggies, and keep them all where you can remember them as you go out the door.